Whether you’re a kid at heart, or have kids at home who are ready to be introduced to the fine art of listening, concepts of rhythm and coordination, and the subtler aspects of communication inherent in drumming (and all music), this U. S. debut – originally created by Doug Manuel, a British artist and social entrepreneur with a passion for Africa, and co-written by Manuel and director West Hyler – is guaranteed to alter your mood and regulate your heartbeat in the most beneficial ways. And while you probably don’t own a djembe – the weighty, hardwood, rope-tuned, rawhide-covered, goblet-shaped drum that originated in West Africa – each and every member of the 450-seat Apollo Theater audience will find one on his or her seat, “on loan” and fully ready to be played throughout the show’s joy-filled 90 minutes. The performers gathered onstage for “Djembe!” (pronounced “JEM-bey”) are led by Fode Lavia Camara, a Guinean master drummer and folklorist; Ben Hope, an actor-musician who starred in the Broadway production of “Once”; and Rashada Dawan, the altogether sensational Chicago singer-actress-dancer who left an indelible impression last season in the Firebrand Theater production of “Caroline, or Change,” and who here reveals totally different aspects of her talent and personality. Joining them in a dynamic, airtight band are Abou Sylla (on djembe and balafon, a West African xylophone with hollow gourd resonators); music director and keyboardist Patrick Donley; Evan Salvacion Levine (bass); Jeffrey M. Swanson (guitar); and Clif Wallace (percussion). 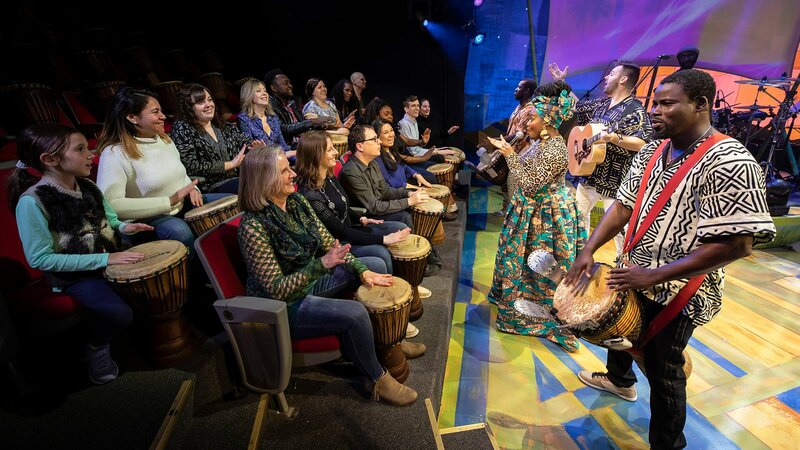 The show includes a very basic lesson in how to play the djembe – how to lift it off the floor and place it between your legs, how to get high and low sounds from its skin, and how to vary rhythms and speeds while interspersing the beating of rhythms with claps, finger snaps and, most crucially, moments of silence. While the musicians are superb in their rhythmic passion, it is Dawan’s glorious, genre-spanning voice, ebullient dancing, wonderfully sassy spirit and three costume changes (cheers for designer Montana Levi Blanco) from contemporary Afro-traditional, to shimmering black sheath, to colorful Calypso-modern blouse and pants, that easily steals the show and infuses it with a warm yet sassy peace-and-love vibe. Pure star quality. Adding color to the scene is Todd Rosenthal’s set, with its handcrafted lanterns and screens for projected lyrics and other messages; Zach Blane’s lighting; Rasean Davonte Johnson’s projections and, best of all, Ray Nardelli’s flawless sound design. “Djembe!” runs through June 9 at the Apollo Theater, 2540 N. Lincoln Ave. For tickets ($39-$53) call (773) 935-6100 or visit www.djembetheshow.com. Running time is 90 minutes with no intermission. One final note: Parking near the Apollo Theater can be a bit of a hassle (and pricey), so either plan to arrive early to find a metered spot, or opt for public transportation.